Bradley is a practicing energetic healer. Through practices and concepts of Yoga, Energy, Shamanism, Medicine, Connection, and Respect, Bradley explores and offers insight. Brad has courageously stepped on-board the Service train in a variety of capacities . 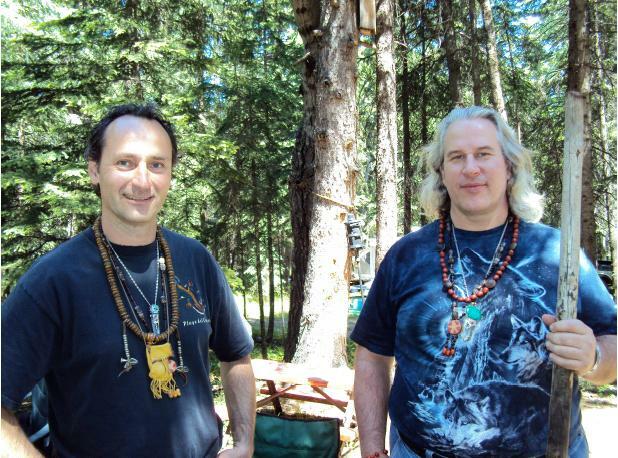 . . through private sessions, guided journeys, work-shops, and retreats on topics such as Intuition, Shamanism, Chakras, Flower Readings, Man's Connection, Yoga . . . he's definitely Walking the Walk! Bradley & Doug are both practicing energetic healers. They met while studying and practicing spiritual healing. Between the two of them they have extensive experience including being Mesa Carriers and Doug is Medicine Bundle Carrier. They are both involved with Community Healing and emphasize finding sacred space in our own backyards. Bradley has a draw towards nature-based spiritual journeys which compliments Doug's strong animistic Shamanism. Animistic Shamanism can be described as exploring the totem archetypes of animals, especially as they relate to and assist in healing. These two inspiring men have both spent time at home and abroad with different cultures, Elders, traditions, and ancient wisdom. Bradley explains, "I have been exploring the nature of who we are from an early age. I have found Shamanism is an inclusive umbrella that most different cultural perspectives of Cosmology (ie. Buddhist, Yogic, Mayan, Christian, Taoist, Spiritualist, Scientific, etc) can find home under once we get to the truth of them. I have always been interested in inter-species relationships and how healing worked. Why does a placebo work? The answer I found lies in our understanding of who we are. My journeys into understanding who we are have brought experience from around the world through different indigenous traditions. Since 2007 I have been enjoying offering healing services and sharing of knowledge through workshops. Nature is my greatest teacher. Doug has devoted his life to learning the ancient wisdom that has been left for us by previous civilizations from around the world. His unique perspective has come from being aware of the similarities that connect these ancient cultures. Doug’s ability to translate this ancient wisdom into simple to understand concepts provides everyone the opportunity to allow their own unique perception to shine through. His presentations are thought provoking and he provides a balanced atmosphere in which to digest the wisdom being shared. Doug’s practical experience as a Shaman and healer has blessed him with the ability to step back and see the world differently from the consensual reality we are living. Brad has also combined forces with Maren Hasse & Darcie Duffin to offer a 3 Day Chakra Connection! weekend. A workshop focused on becoming aware of energy centers, Chakras, aligned within & without our body and energetic self. Using a combination of energy exercises, meditation, and a physical yoga asana practice we will purposefully aim to come into awareness, understanding, and balance with our physical and energetic selves. Learning how physical body, emotional body, mental body, and energetic body relate to Self, Environment, & Spirit.